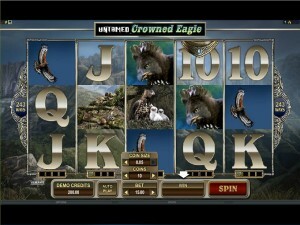 Untamed – Crowned Eagle is a slot machine from Microgaming. 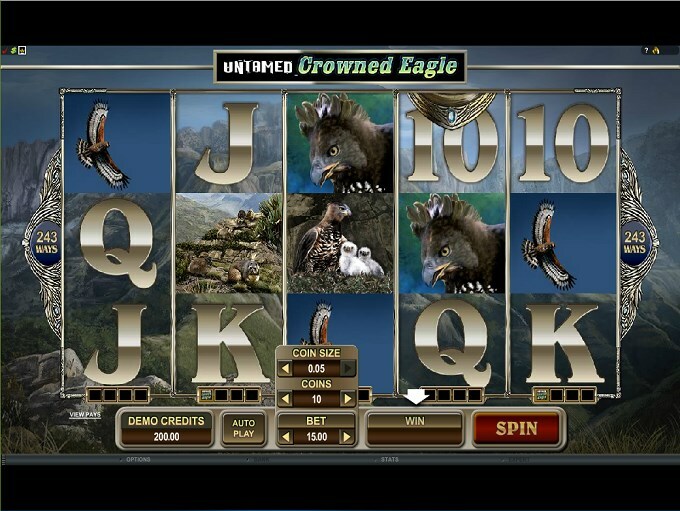 Three other Untamed slots exist in their collection, the others being themed around Bengal tigers, Giant Pandas and wolves, while this one is obviously inspired by the Crowned Eagle. The games seem to be similar in a lot of ways, but their design is different. The subject of this game, the Crowned Eagle, is an African bird of prey that reaches lengths of up to 90 cm and weighs about 11 kg. You get 5 reels and on them a fixed number of ways to win, at 243. 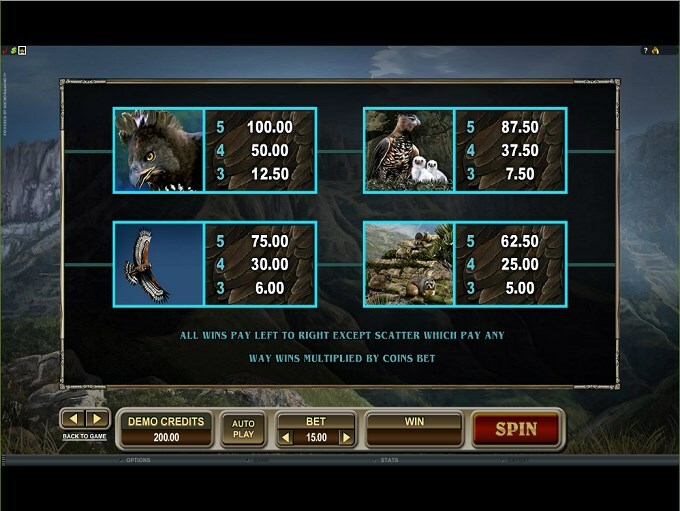 The features include the wild symbol and the possibility to collect it and turn it into wild reels, plus scatters, lucky nudges and free spins. The biggest prize is worth $5,625. 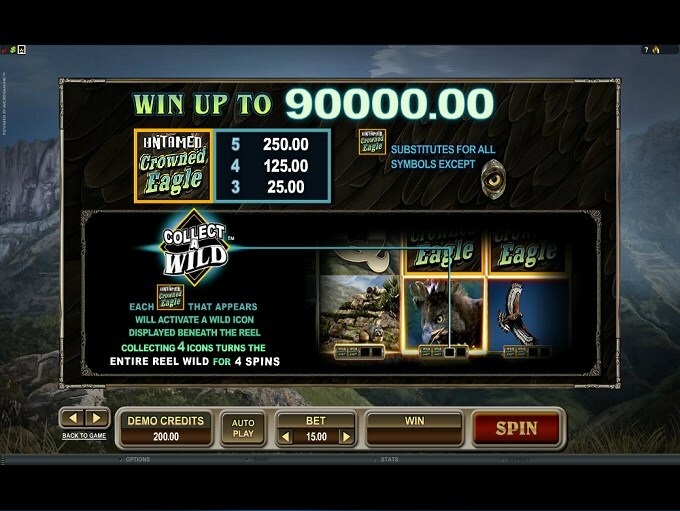 Crowned Eagle relies on wild symbols which can be collected and turned into wild reels, on free spins with soaring wilds, on nudges and on scatters. It’s a collection of features that gives you something extra for each symbol, not just the basic powers that every slot seems to have for them. 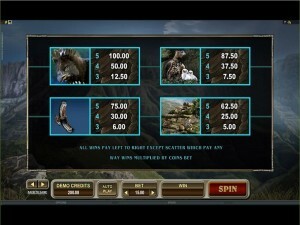 The game relies on ways to win to hold its winning combinations, which is to the player’s advantage, as this type of payline isn’t the kind that uses fixed positions. Having symbols on the right reels, going from the left to the right, and in consecutive order, will be enough to form a combo of 3+ symbols. 243 ways to win are part of the game. The wild symbol is the one you would expect to get in any slot machine, nothing really special about it. It will substitute for symbols which are needed on the reel on which the wild appears, and this happens all the time since ways to win are used here. The only symbol which can’t be replaced with a wild is the Eagle Eye scatter. Payouts of up to 500x are possible when wilds form their own combinations, of three to five icons. The game also allows you to collect wild symbols whenever you get them. They are kept in small boxes placed underneath the reels. Once you collect four wilds, the reel underneath which they are found will be turned into a wild for the next 4 spins. The scatter symbol of the game has the Eagle Eye image on it. As a scatter, it can appear even on reels which are not going from left to right, or they’re not in consecutive order. 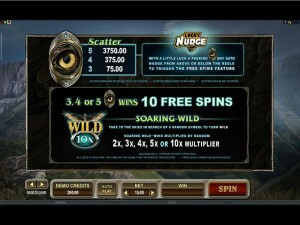 As long as you have 3 or more Eagle Eyes present, you get paid and you also activate free spins. The cash prizes vary between 5x and 250x the wager. 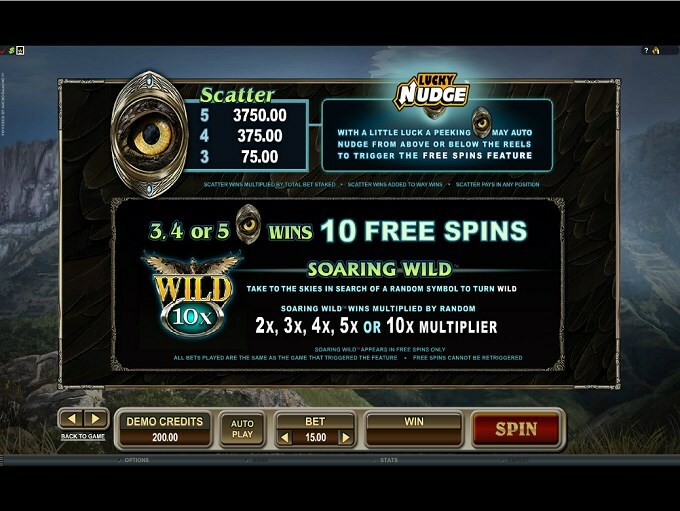 The same 3+ Eagle Eye scatters will award you with 10 free spins, during which the Soaring Wild is present. You get a random wild symbol with the help of this feature, which multiplies prizes by 2x to 10x, the value being chosen at random. This feature will help out with the free spins in certain cases, moving scatter symbols to the visible part of the reels, when they’re right next to it, so they can be nudged one position up or down. 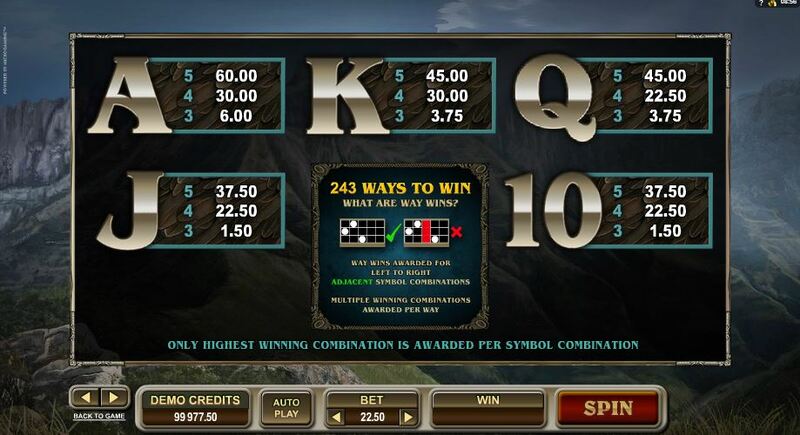 You can wager a maximum of $0.75 on one line, with 30 lines being part of the betting system, sufficient to cover the 243 ways to win used by the game. 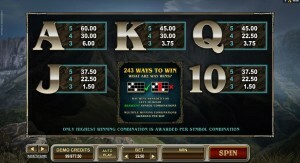 The line bet uses as many as 15 coins for that small wager, with denominations reaching $0.05. The total bet for the game is at $22.50, while the minimum is $0.30. You can get paid with the wild’s help and receive 500 times the line bet back, but that’s only $375. The scatter’s top reward is much better, with 250x the wager or $5,625 up for grabs. The game will show off the Crowned Eagle, so you will see multiple symbols which include this bird and its offspring. The images also show you the majestic views of the mountains where the birds live. Playing cards are unfortunately part of the action, all of them similar but using different background pictures. Symbols: Eagle Eye (scatter, 250x the bet), Game Logo (500x, wild), Crowned Eagle (200x), Eagle Nest (175x), Flying Eagle (150x), Raccoons (125x), Ace (80x), King (60x), Queen (60x), Jack (50x) and 10 (50x). There are creatures which are a lot more majestic than the Crowned Eagle, so it doesn’t feel like a great choice, but if you want to give all the Untamed slots a try you can see how this predator bird can be like. This Untamed – Crowned Eagle slot is offered by all online casinos with Microgaming software, playable either in practice or in real money mode.